In 1944, Livingston & Evans were offered the opportunity to go to Hollywood by Ole Olsen, half of the famous comedy team of Olsen & Johnson. Seems Olsen wanted Livingston & Evans to drive his car to Los Angeles. After only having one hit in NYC, “G’Bye Now”, L&E thought it might be time to try their luck in the film capital of the world. L&E’s first assignment and paying gig in Hollywood was on behalf of Producers Releasing Corp. PRC was a small independent film production company that produced a film from beginning to end in one week. L&E were brought on to write and arrange songs for a total of four films in 1944 and 1945. The first film was titled WHY GIRLS LEAVE HOME. L&E wrote and arranged ‘What Am I Sayin’?, “Call Me”, and “The Cat and The Canary”. To everyone’s surprise, especially Livingston & Evans, “The Cat and The Canary” was nominated for an Academy Award! SWING HOSTESS starring Martha Tilton was the second film L&E were brought on to write and arrange for. Martha was also a terrific singer and Capitol Records recording artist. L&E wrote 6 songs for this film, “Let’s Capture This Moment”, “I’ve Got An Invitation”, “Music To My Ears”, “Say It With Love”, “I’ll Eat My Hat”, and “Highway Polka”. Martha performed a couple of these songs in the film. During this time, because Martha and L&E had become close friends and she was beginning her new record for Capitol Records, Martha presented some of L&E’s songs to the head of Capitol Records and hit songwriter, Johnny Mercer. Mercer did not end up recording any of these songs, however, Livingston & Evans now had entrée to him. Shortly thereafter Mercer, who had a nightly national radio show, began to perform Livingston & Evans songs “The Cat and The Canary”, “Band Baby”, and “Highway Polka”. Three cute little numbers that fit Mercer’s Southern style and rhythm. 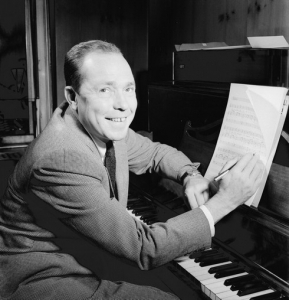 See how this new relationship between the great Johnny Mercer and the two new young west coast arrivals, Livingston & Evans, turned into Gold in Hollywood.